The Classic Invitation's Weblog | A blog for all things Wedding! Enter today to win a free monogram! Simply “like” Love on Paper’s Facebook page and follow the instructions to enter! One lucky entrant will be chosen at random to win a free monogram of their choice! Contest runs through June 15, 2013. Enter to Win a Free Monogram! We have a new look, new business model, easier ordering system, and new products! We’ve recently begun selling a small selection of custom designed digital monograms on Etsy and we would love for you to check us out! You have two options to find us on Etsy. You can visit us directly at http://www.etsy.com/shop/theclassicinvitation. Or visit our My Etsy store on Facebook (and while you’re there “Like” us!) http://www.facebook.com/pages/The-Classic-Invitation. 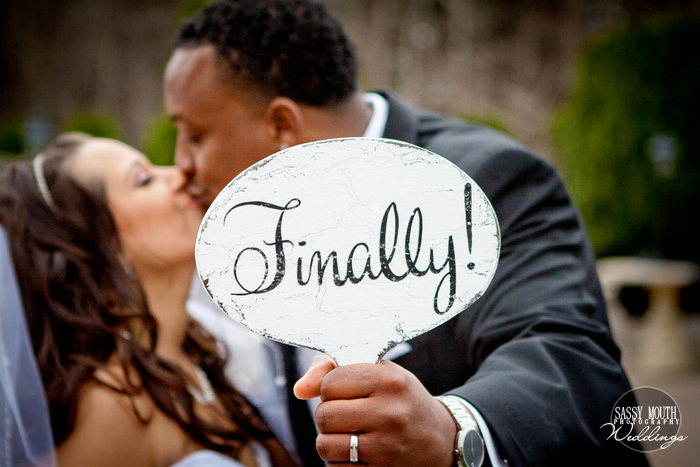 We will be adding a few select printable wedding invitation designs soon so keep an eye out! I recently was asked to design an invitation that was as stylish as it is eco-friendly. So I set out to design an invitation with that in mind and this is what I came up with! Mission accomplished! When it comes to planning a wedding that is “Green” the invitations and stationery are often one of the least eco-friendly components of the wedding. They are made from paper, they are used once, they are shipped, mailed and delivered which leaves a carbon footprint, so for all these reasons they are often not something that is viewed as eco-conscious. BUT I can assure you that this design helps to reduce the impact of each of those points! First the paper and envelopes selected are made from partially recycled content and the raw material in the paper is FSC certified. The FSC trademark identifies products which contain wood from well-managed forests certified under the rules of the FSC, ensuring that people, wildlife and the environment benefit from the forestry practices. Next, The Classic Invitation seeks out and purchases our paper goods through a supplier that operates with 100% wind energy and offsets 100% of the carbon dioxide produced from outbound shipping through the purchase of renewable energy credits. In our studio, The Classic Invitation buys our electricity from a wind farm, so the carbon footprint of each invitation our studio produces is further reduced throughout every stage (from design to printing) of production in our studio. And though these wedding invitations are designed to be used once, and though we hope they will be saved and treasured as a keepsake, they are fully recyclable! Which makes them even more stylish than they would be otherwise. Our motto at The Classic Invitation is eco-friendly design with style in mind! Interested in eco-friendly wedding invitation design? Contact us at www.theclassicinvitation.com. I’ve been working on a new collection of classic monograms. I wanted simplistic elegance. 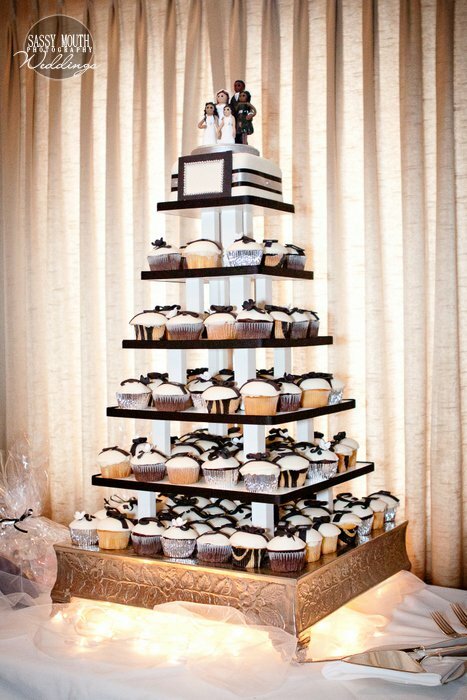 Something that could be carried throughout a wedding venue with simple touches, the menus, the table numbers and even the cake! I hope you enjoy! 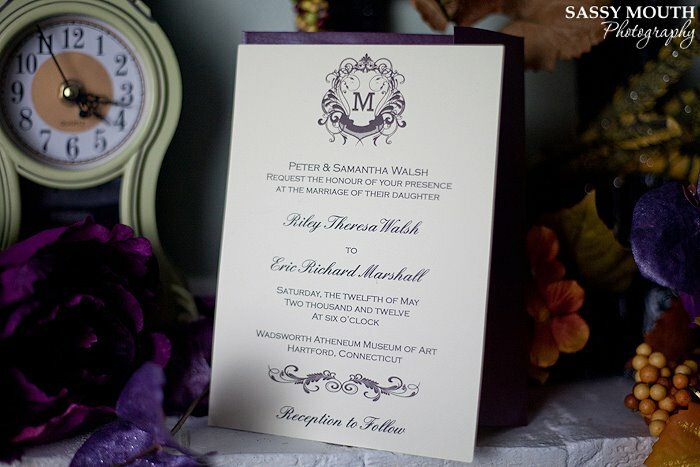 To view more monograms visit www.theclassicinvitation.com. What are monograms typically used for? One of our clients recently asked: “What are monograms typically used for?” So I thought I would answer that question here for everyone. Monograms have a wide variety of uses and come in any style, from classic to modern. Typical uses for printing monograms include save-the-date cards, invitations and stationery, programs, table card numbers, seating cards and thank you cards. Including a host of other printed options! Another popular (and great!) 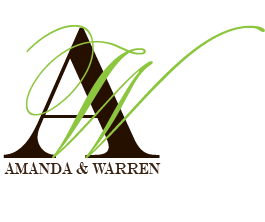 use for a monogram is to display it on the dance floor or wall of your venue. A fun use (and less expensive alternative to a photo booth) is to print the monogram on a back drop to use as a step and repeat for guests to take pictures in front of at the wedding reception. 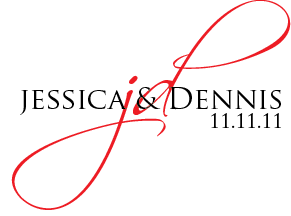 Digital uses for a monogram include wedding websites, logos and even in email correspondence it can be inserted into a picture or used as a picture itself. After the wedding is over use the monogram file to order/create custom monogrammed towels or sheets! The options for using a monogram are really endless. The Classic Invitation offers both custom designed monograms and personalized pre-designed monograms. 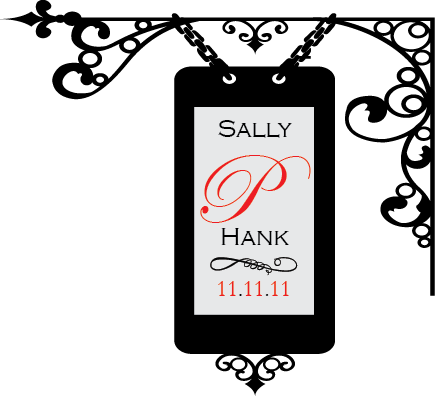 To order visit http://theclassicinvitation.com/monograms.aspx. Glamorous Vintage Inspired Wedding: Gone With The Wind! I recently had the honor of designing wedding programs for a good friend’s wedding. And what a beautiful wedding it was. 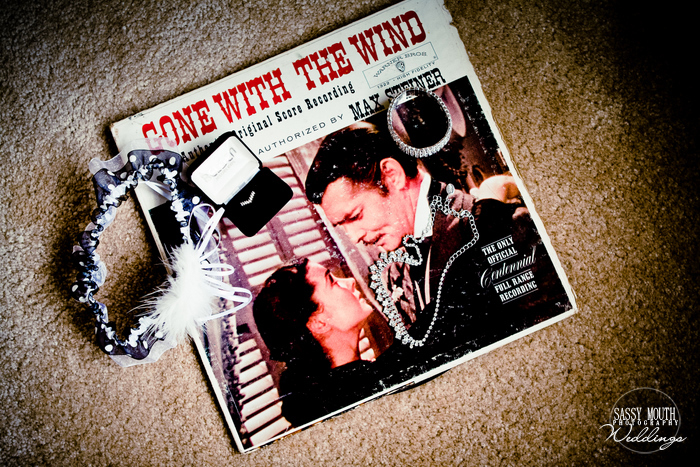 I just loved all of the vintage details of their Gone With The Wind themed wedding. And, I am so excited to share with you some of the cutest wedding ideas that I have seen in a long time! 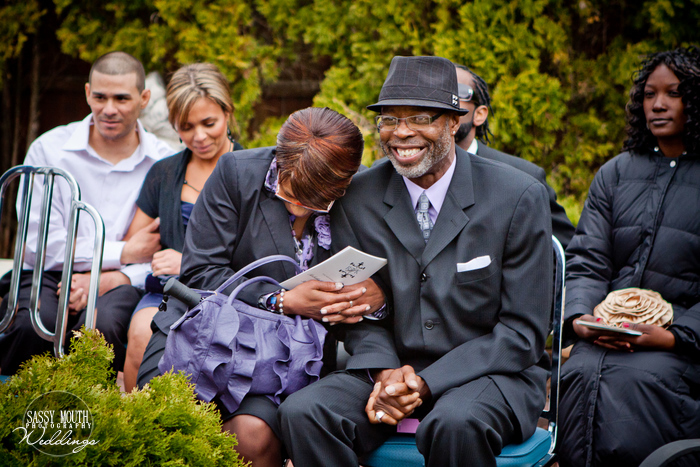 The wedding photographer, Sassy Mouth Photography, shot the pictures. Enjoy! It’s the little details that count. I love the feather accent on the garter. And as the saying goes, diamonds are a girls best friend! 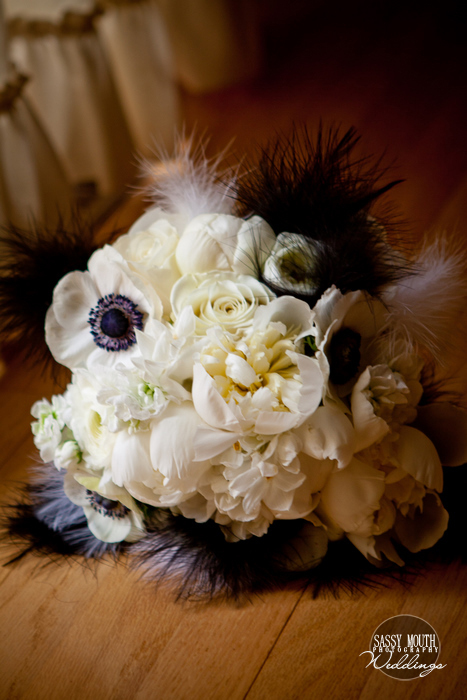 The feathers added just the right touch to this bouquet. Just lovely. The brides maids were so glamorous! 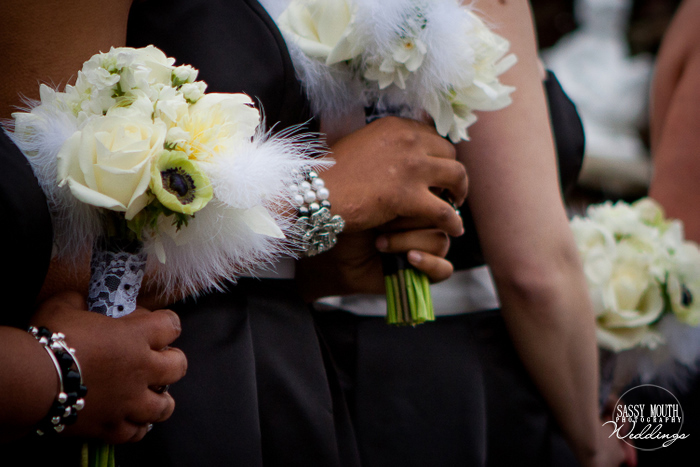 With smaller white feather accented bouquets to compliment the brides bouquet, pearl detailed bracelets and black dresses with a simple black on black sequined polka dot detail the vintage details were simply stunning. One of our programs in action! 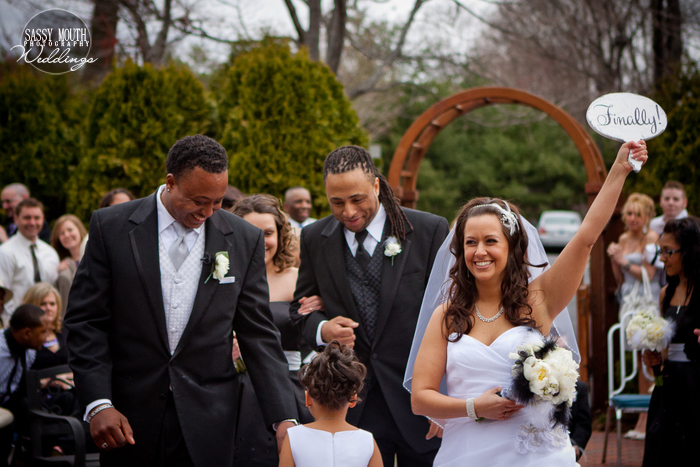 We designed a black and silver monogram with rhinestone accents to compliment the vintage feel to the wedding. The program is printed on white linen heavy weight stock paper in black ink. The bride loved them! “Thank you so much for all of the time you spent making the programs PERFECT! 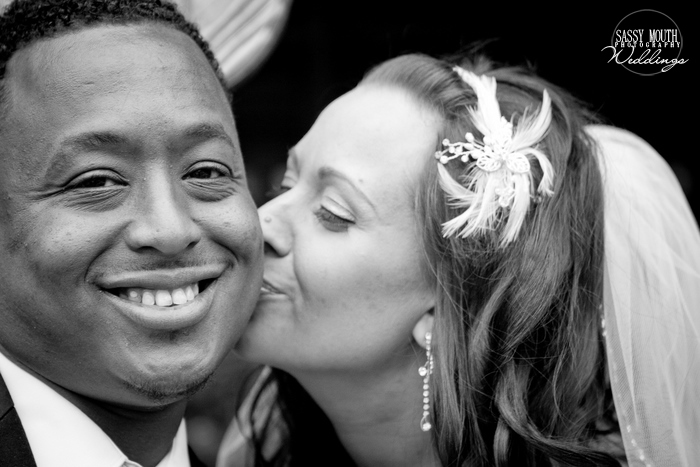 XOXO” – Becky and Khalim 4/11. I am so pleased that they loved them! 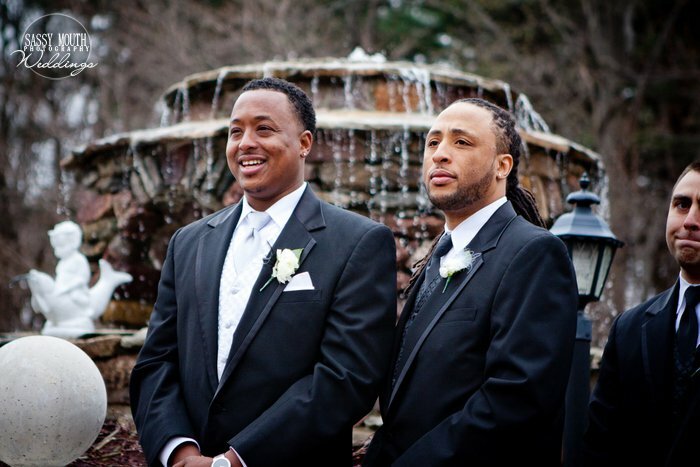 Need programs or wedding invitations and stationery for your wedding? Contact us at www.theclassicinvitation.com. It was slightly chilly that day! 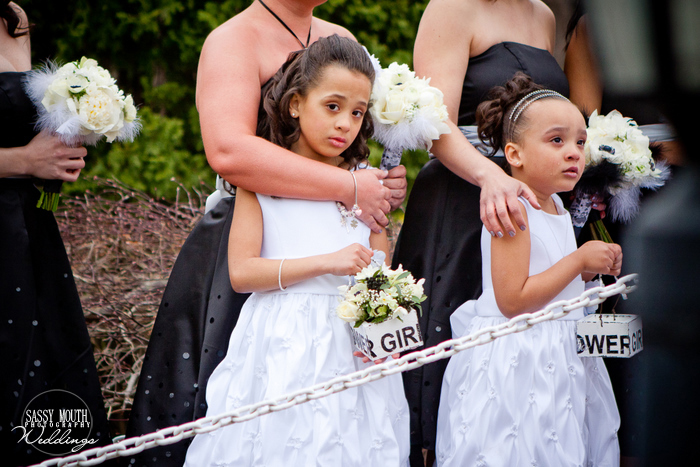 But the flower girls were adorable none the less! And I am so pleased to share with you the cutest idea for your flower girls! It is a totally doable DIY project. 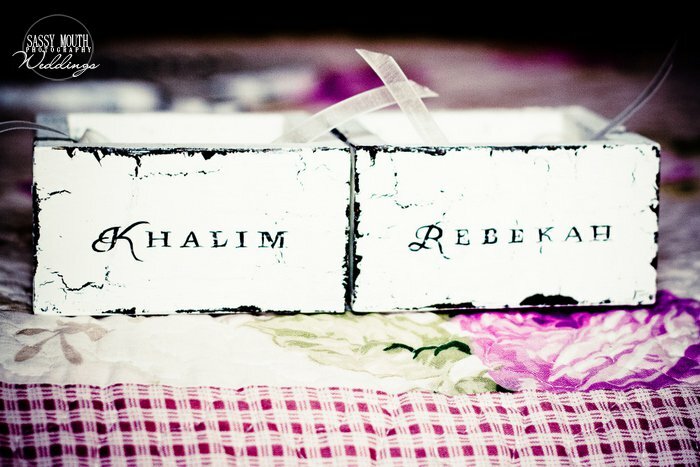 A simple box painted with a distressed white paint to give it a vintage feel, letter stencils for the wording, and glitter paint to customize the box with the flower girls names. Add flowers or flower petals and voilà! A great addition to your vintage inspired wedding! And a cost-effective project too! OMG! How great is that sign? Yeah I know, its fabulous! The happy couple has 3 children and have been together for 14 years, which makes the message on the sign truly befitting. The feather hair accessory is right on trend for this wedding season. And how beautiful both the bride and the feather hair band look! The feathers coordinated with the garter, bouquets and boutonnieres. And truly complimented the vintage Gone With The Wind theme. Simply stunning. The photo booth was soo much fun! All of the guests enjoyed the props and taking pictures. The vendor made two copies of each series of pictures and assembled a scrap-book with the pictures through out the wedding. The guests were asked to write messages and signatures next to their photos. I highly recommend it if you are considering one at your wedding. I had a blast! The seating cards were filled out by one of the couple’s daughters. What a sweet idea! Not only did their daughter do a great job, it was also meaningful to the couple to be able to include their children in the DIY projects for the wedding and provide them with a sense of responsibility and trust. I just love it! 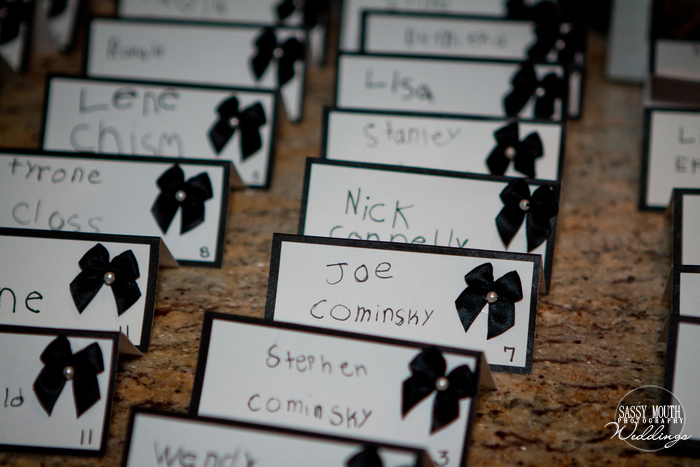 And the little black bows with a pearl accent was the perfect finishing touch to the seating cards. 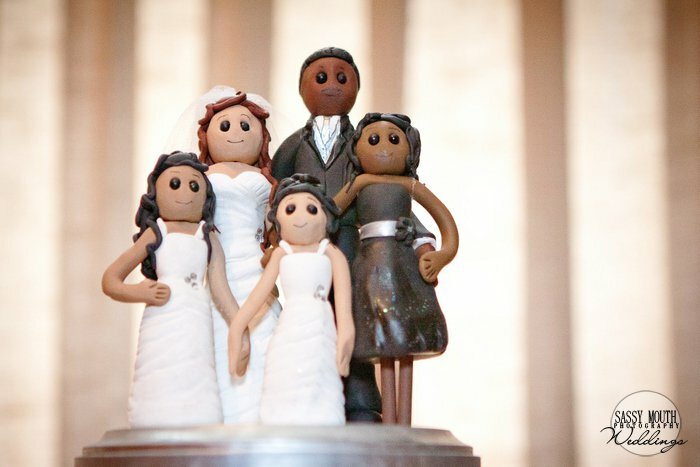 Custom designed cake family cake topper for their cup cake tower by A Little Imagination Cakes. You can visit their website at http://www.imaginethatcake.com/. 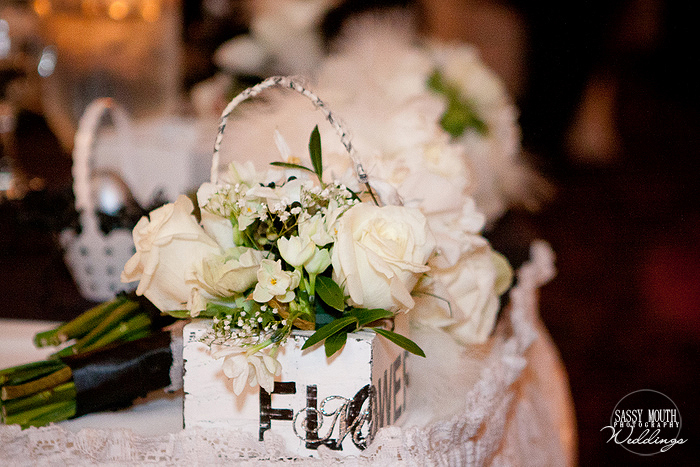 What a truly beautiful Vintage inspired wedding! I hope that you are inspired too.